Here is the completed block for Catherine's DYB6 swap. Because Catherine included lots of 3D ruched and gathered fabrics in her blocks, I've tried to make most of my additions also 3D. Catherine liked the waterlily and dragonfly charm so I've left them in the centre of the smocked "pond", then added a pink blossom tree branch livened up with a few pale pink Swarvoski crystal beads from Czech Republic and a row of ribbon flowers and stems which also have glass beads in the shape of leaves, also from Czech. I was lucky enough to have a very good friend go to Czech over Christmas and New Year on holiday and she brought me back lots of little bags of beads. I didn't know what to do with the large green lace flower so last night while watching Miss Marple solve yet another murder, I sewed the turquoise glass beads with hot pink centres into the centre of the flower. 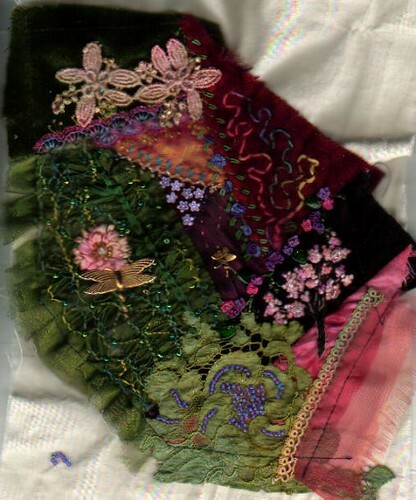 Because one line of lace to be beaded is right on the seamline, I have left that empty until Catherine has joined these odd shaped pieces into a cushion and have sewn a little worm of beads off the blocks for Catherine to sew on later. I hope you like your block, Catherine!! Viv, I found your blog through my beautiful friend Julia C from AU. You know, the one with the talent oozing from her pores.LOL. Anyway, I absolutely am loving your work. I see you are an encruster too! I am going to browse some more and add you to my favorites list. Thanks for the inspiration. Just gorgeous! Who gave you permission to use the name of my ancestral home.